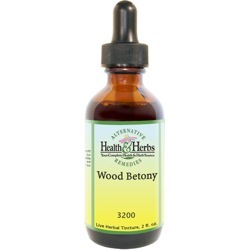 Wood Betony has been used for easing headaches, especially those related to nervous tension, anxiety, and debility. It's relaxing to the heart and nervous system and has been beneficial for neuralgia as well as, neurasthenia, intense irritability and nervous exhaustion. It also helps to facilitate digestion, relieve gastritis, heartburn, and gas. It is known as a blood purifier that is believed to improve liver, gallbladder and spleen health. An herbal sedative, Wood Betony may also induce relaxation and sleep and has been used in for treating hysteria, and hangovers. This herbal remedy helps to calm and soothe frayed nerves, diminish hyperactivity, ease stress, reduce tension and anxiety and other nervous disorders, such as convulsions, hysteria, palpitations and panic/anxiety attacks. It is also mildly sedative, which helps to allay excitement, induce relaxation and help you to sleep. It is also associated with use for fatigue and pessimism. It is also thought to nourish the pineal gland, protecting it from degeneration. And interestingly, degeneration of this gland is thought to cause insanity. Wood Betony is thought to be antispasmodic and has been used to relax muscles (including muscles of the face), control nerve twitching in the face and palsy. Called "Herb for the Head" in the past, it is believed to be an excellent way to relieve headaches, particularly those of nervous origin and associated with nervous tension, anxiety and debility. It has also been used for headaches located at the top of the skull or for pains of the face, and some herbalists claim that when taken daily, Wood Betony will prevent migraine headaches. Used for centuries to aid the digestive system and to relieve gastric disorders, it helps to improve the appetite, relieve gas, heartburn, gastritis and poor digestion. The herb's stomachic qualities tone and give strength to the stomach, helping to relieve stomach cramps, colic pains, and other stomach distress. Wood Betony, as an expectorant and has been used to loosen and expel excess upper respiratory tract mucus and has been helpful in relieving sinusitis, colds, la grippe (influenza), chronic asthma and bronchitis. It has also been used to improve varicose veins (used daily), edema, scrofula, and tuberculosis. It is considered to be a mild laxative, as well as an anthelmintic that has been used to destroy and successfully expel worms from the intestinal tract. Recently research has stated that Wood Betony is good for cardiovascular health. It is said to be mildly stimulating to the heart and has shown some effect in lowering blood pressure. Wood Betony is said to have diuretic properties that may increase the production and flow of urine and has been effective in easing bladder and kidney problems, flushing the kidneys and expelling impurities and kidney stones. When used externally, it has been useful for wounds (especially when infected), cuts, bruises, insect bites, hemorrhoids, external ulcers and cold sores. It is also good for a sore throat and gum inflammation. Ingredients: Wood Betony Leaf, Structured Water, 20% Alcohol. Non-Alcohol: Wood Betony Leaf, Structured Water, Vegetable Glycerin. Contraindications: Wood Betony Herbal Supplement is not recommended for pregnant or nursing women. It is said that Wood Betony may take months before it shows results. Overuse (many times the recommended dosage) may cause diarrhea and upset stomach. From Patricia Boyter of Tucson, Arizona on 8/5/2018 .